“Fintech”: A hot growth sector, but where are the customers? Your Mexican wall rebate… the problem with “the art of the deal” in international diplomacy… the truth about “repealing and replacing” Obamacare… and more! The Dow Jones industrial average crested the big round number for the first time this morning, minutes after the open. CNBC saw fit to send an alert to your editor’s iPad — in ALL CAPS, no less, to convey the magnitude of this development. “Brace yourself… traditional banks are about to go the way of record stores, bookstores, taxicabs and travel agents,” says our small cap specialist Louis Basenese. “Fintech,” as it’s come to be known, is one of the buzzwords of 2017. “The blanket term describes any company focused on using technology to make all manner of financial services more efficient,” Louis explains — “from stock trading to lending and insurance to payments. “Rest assured,” says Louis, “the trend remains well intact. According to KPMG and CB Insights data, global fintech investment in the first half of 2016 soared by 148%. 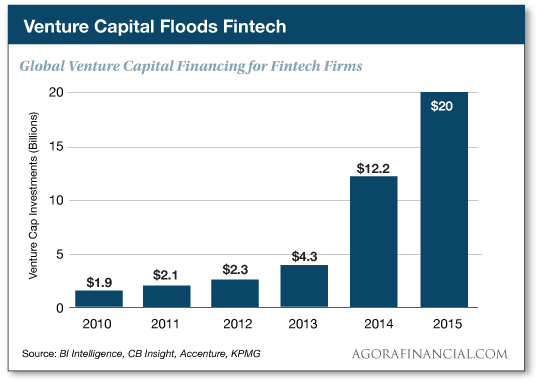 But for all that growth, fintech is a dicey sector in which to invest. “Despite the billions upon billions of investment — and the 8,000-plus startups operating in the industry — most fintechs are still trying to figure out how to attract customers,” Louis tells us. Oh, yeah, customers! Kinda important if you want to stay in business, right? Louis has identified a name in this fast-growing sector for which customer acquisition is no problem. Since recommending it to True Alpha readers three months ago, it’s already up 30% — a darn sight better than the fintech ETFs trying and failing to capitalize on the next big thing. Better yet, Trump is about to light a fire under the fintech sector. “The early read from tech giants including Amazon, Google, Apple, PayPal and Intuit is that the new administration is going to support fintech-friendly initiatives,” Louis says. Now Louis is counting on a buyout that could propel shares of his favorite fintech name by another 20%. That’s just one small example of the $11.1 trillion torrent of wealth Louis believes Trump’s policies will unleash. A grubstake of just $100 could turn into a $1.5 million fortune and assure you a far more comfortable retirement. Louis shows you how to get started when you follow this link. The hot money flowing into stocks today is flowing out of bonds and gold. As the morning wears on, the Dow has sailed up to 20,071. Naturally, traders are keeping an eye on Trump’s latest executive orders — including the one for the Mexico border wall. Contrary to his campaign promises about making Mexico pay for it, the president now plans to use your money to build it and then send Mexico a bill for reimbursement. “The main driver of the gold rally of 2017 will be a weaker U.S. dollar,” says Jim Rickards. 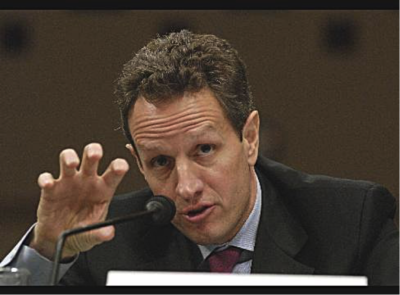 “After all, the dollar price of gold is simply the inverse of the dollar itself. A strong dollar means a lower dollar price for gold, and a weak dollar means a higher dollar price for gold. It’s that simple. “Gold is money. The dollar price of gold is just another cross-rate like the euro-dollar cross-rate or the dollar-sterling cross-rate. The strong dollar was killing the U.S. economy through the loss of exports and export-related jobs. A strong dollar also imports deflation to the U.S. and is a major head wind for the Fed’s inflation goals. “There’s another factor driving gold higher, which is good news coming out of Europe,” Jim goes on. “After the Brexit shock and the Trump shock, mainstream media decided more shocks were in store and began predicting nationalist, protectionist victories in coming elections in the Netherlands, France and Germany this year. “Oops, wrong again. While the nationalists won in the U.K. and U.S., it appears the more conservative and centrist parties will prevail in European elections.” For instance, Marine Le Pen’s nationalist party in France is poised to pick up seats, but not enough to form a government. Based on his extensive sources, Jim even believes Germany’s unpopular Chancellor Angela Merkel will emerge victorious in elections this September. “The result,” he says, “will be a stronger euro to satisfy inflation-phobic German voters. A stronger euro means a weaker dollar, which means a higher dollar price for gold. Everything’s connected. “The bottom line is that the great 2017 gold price rally has just begun, and it’s not too late to get in on the action.” And if you want to juice those gold gains with a cheap and lucrative junior gold stock, Jim’s got just the idea right here. We’d categorize this next item as “only in New York” — but it wouldn’t surprise us if money-grubbing big-city governments elsewhere don’t do the same thing. 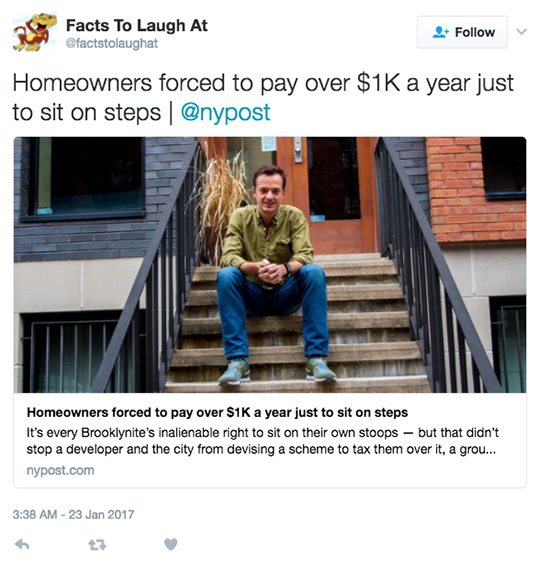 It turns out more than 30 homeowners in Brooklyn are paying the city more than $1,000 a year for the privilege of climbing the steps to enter their own homes. The legal term for this arrangement is a “revokable consent agreement” — which also means city bureaucrats can order the steps demolished if they decide that’s what they want to do. The homeowners sued the city in 2015, arguing such agreements apply only to temporary structures like scaffolds or awnings. Last week, the judge sided with the city. Their lawyer says they might appeal, or sue the developer. “Perhaps your newsletter could review the quality of humor,” a reader entreats after yesterday’s episode. “Gads, I’m not being paid by Agora, but I have to write what I expected you guys to write about the South China Sea,” a reader writes. “The bold language about a China blockade of South China Sea islands was an ‘opening offer’ in a Trump negotiation. His goal is to get China to agree the islands are not Chinese territory (which they aren’t). What Trump will ‘give up’ in the negotiation is a statement that if China (or anyone) builds assets in international waters (whether drilling platforms, airports, vessel docks or whatever), they are owned by the builder (just like drilling platforms). “The best example is the ‘One China’ policy. Trump wants to put this in play as a bargaining chip to force Chinese concessions on trade, tariffs and foreign exchange. But the Taiwan issue is completely nonnegotiable from China’s perspective. The Chinese might as well ask Washington if California can seek independence. California is part of the U.S. and Taiwan is part of China as far as the Chinese are concerned. Case closed. There’s nothing to negotiate. “Hillary’s China policy becomes Trump’s,” a reader keys off our big theme yesterday, pivoting to another topic… “and The Donald’s health care plan sounds an awful lot like Obamacare. “1. The Affordable Care Act was a half-baked version of socialized medicine that was designed, from the beginning, to fail; and now President Trump & co. will give us the fully baked version. Of course, it will be called something different (and loaded with another ton of pork). Hey, why pass a law only once when you can do it twice at double the cost, right? “2. It doesn’t matter who’s in the Oval Office, or the Senate, or the House. Nor does it matter which political party these actors claim to be affiliated with. We are a nation of, by and for the corporation; and our Republicrat politicians are just the stuffed shirts who serve them! The 5: Good on you for not drinking the Kool-Aid. There’s going to be much more to say on the subject as this year unfolds. P.S. There’s a way to get out from under Obamacare right now, without waiting for Trump or Congress to act. You can save up to $11,172 a year in insurance premiums… your deductibles can be as low as $500… and you have a vast choice of doctors and hospitals. Don’t wait for Washington to act. Take back control of all your health care decisions right now. Here’s where to get started.